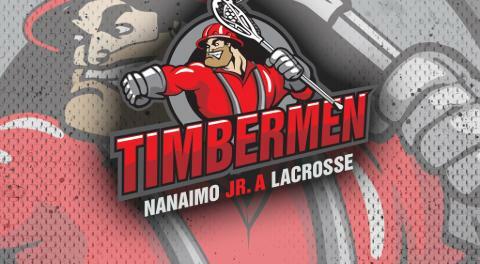 The Timbermen started the long weekend with a gritty performance against Poco on Saturday. Nanaimo lost 8-7 in a game that was close throughout. After 40 minutes the Tmen trailed 8-5 but scored the only two goals of the third, before coming up just short. Jake Mickelson had four points to lead the offense, while Ryan Sheridan chipped in three assists, and Thomas Vaesen had two goals. Colin Jeffrey was very strong in net making 31 saves. The holiday Monday was a tough outing for the team in New Westminster. Nanaimo lost 18-3 with two of the team's goals coming from first year player Arthur Miller. Colin Jeffrey faced 61 shots in the loss. June 29 was a big day for two members of the team as Thomas Vaesen and Will Johansen got called up to the Senior A Timbermen and played a game at the Q Centre in Victoria. Vaesen had three assists and Johansen had one as the Tmen lost 11-10 in overtime. Both players showed well making their debuts playing Senior A ball. On the trade front Nanaimo traded Adam Fulton and future considerations to the Coquitlam Adanacs for Trevor Funk, and the Adanacs 2019 3rd, 4th, and 5th Round picks.